For the longest time I had no idea you could actually call your Pharmacist. On the phone. And the vicious mace weilding trolls that kept the screaming cold and flu suffers back from their counters would let them speak to you. For some reason I thought they were like the diamond rings you see in jewelry store windows, on display so you know they are there, but not to be touched. The thought that I could actually interact with them stunned me. I always thought you shouldn't bother them. I can hear my mother's voice hissing at me not to disturb the nice lady while she is working. 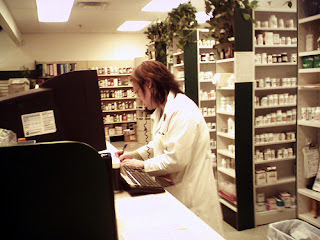 Actually, it is probably a good rule of thumb not to interrupt a pharmacist in the middle of mixing pills. Sage advice that. Feel free to share it. But now I know they are the great untapped wealth of knowledge I have been looking for. No longer will I be shackled by needlessly worry over cross drug reactions, especially the ones written in bold print on every box of cold medication I have. Nor will I fret about which vitamins to take, or even wonder why one type of antihistamine is cheaper then another - I will boldly ask, or because I'm lazy, call my Pharmacist. If you have a banker, why don't you have a Pharmacist? Posted by Heidi Schempp Fournier at 12:26 a.m.
Pharmasists are much better at actually telling you which medication is best Doctor's "not so much"